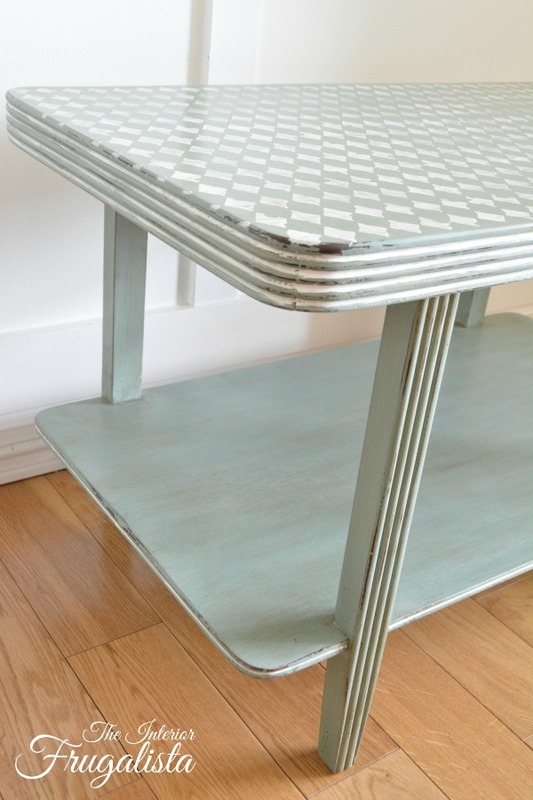 Today I'm sharing one of the easiest furniture makeovers I've ever done. Why? Because most of the work was already done for me! 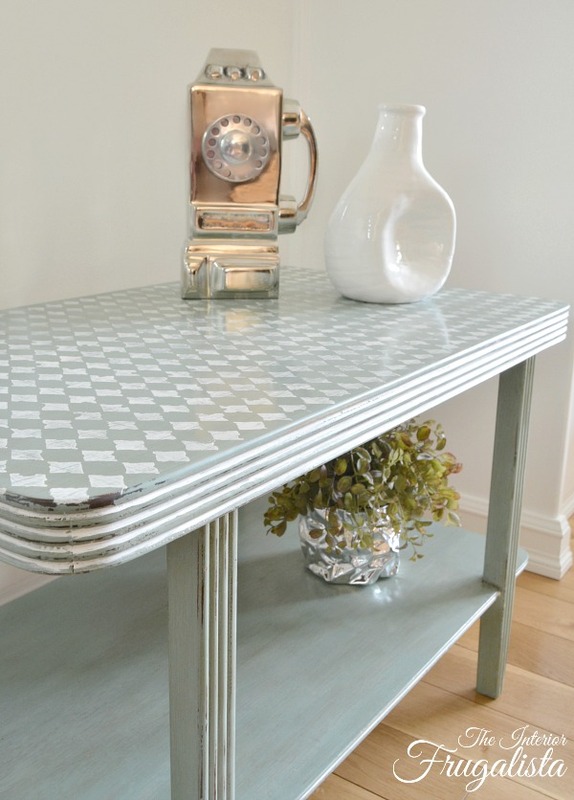 All I had to do was inject some personality to make this Distressed Harlequin Art Deco Side Table sing! This is where I normally add a before picture but I was so excited to dig into this makeover that I completely forgot. You can get a pretty good idea of what the top looked like on the bottom shelf. Like I said, the distressing was already done for me and I didn't mind the original dark stain showing through. The first thing I did was grab an art brush and paint Pure White chalk paint inside the grooves, not being fussy about getting the lines perfect. 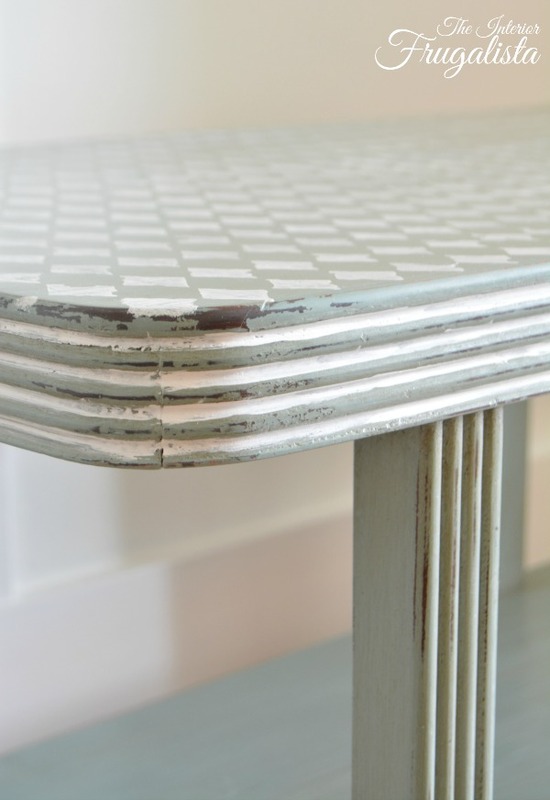 I knew my Distressed Harlequin Stencil would be perfect to add some personality to this table. For those of you who haven't stenciled, the trick to not getting paint bleed is to load the paint sparingly by dipping just the tip of the brush into the paint and dabbing the excess off onto a paper towel. Another important factor is having the stencil lay perfectly flat against the surface. You can do that with either repositionable stencil spray adhesive or good old fashion painter's tape. Some people prefer to use a stencil pouncer and dab the paint on. Others prefer using a mini sponge roller. My personal preference is using a good quality bristle stencil brush and applying it with very little pressure in circular motions. Using 220 grit sandpaper, I lightly sanded the top to distress the harlequin pattern. 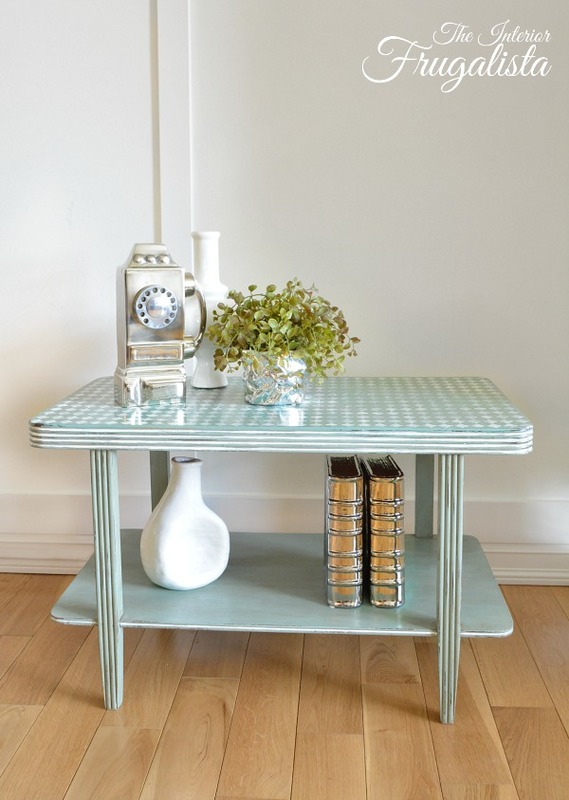 If only all my furniture makeovers were this easy! 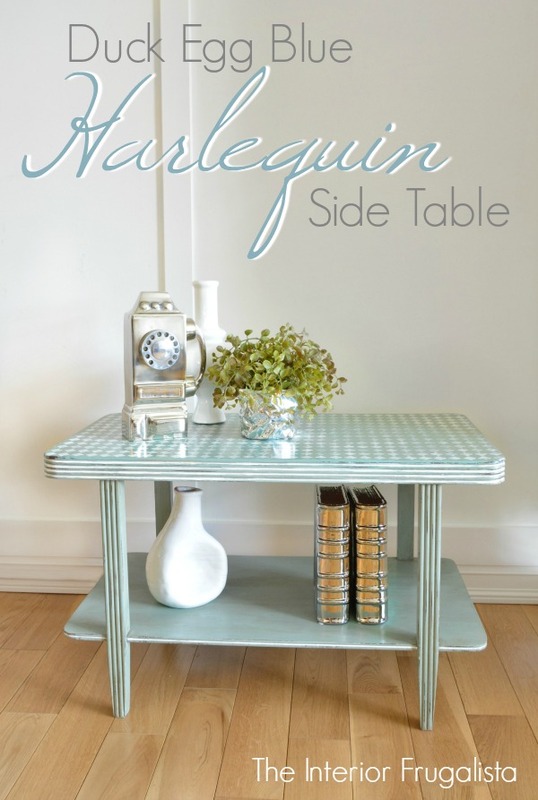 If you like my Harlequin Side Table makeover please share it with a friend and/or save it on Pinterest. Are you a pouncer, roller or brush kinda gal (or guy)? 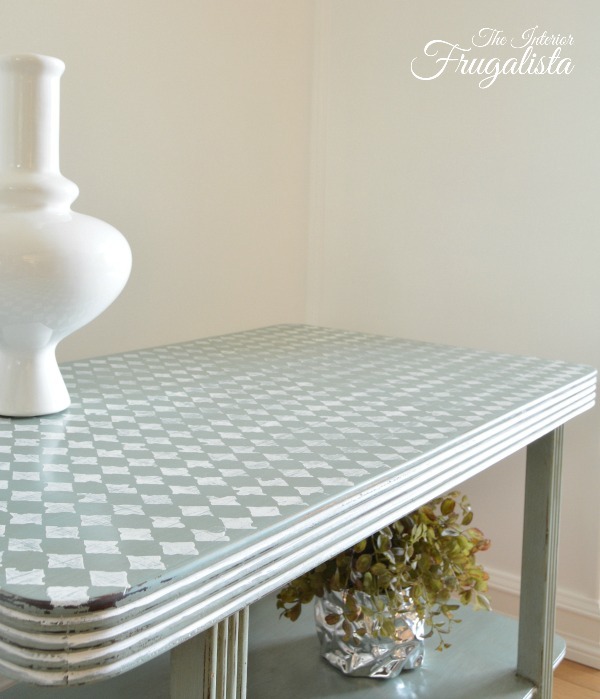 If you haven't stenciled before or haven't had much success in the past, has my Distressed Harlequin Art Deco Side Table inspired you to give it a try? Rather than an allover stencil, start small with just a single stencil like I did on our Dining Room Headboard Bench and a client's Birds of Paradise Coffee Table. 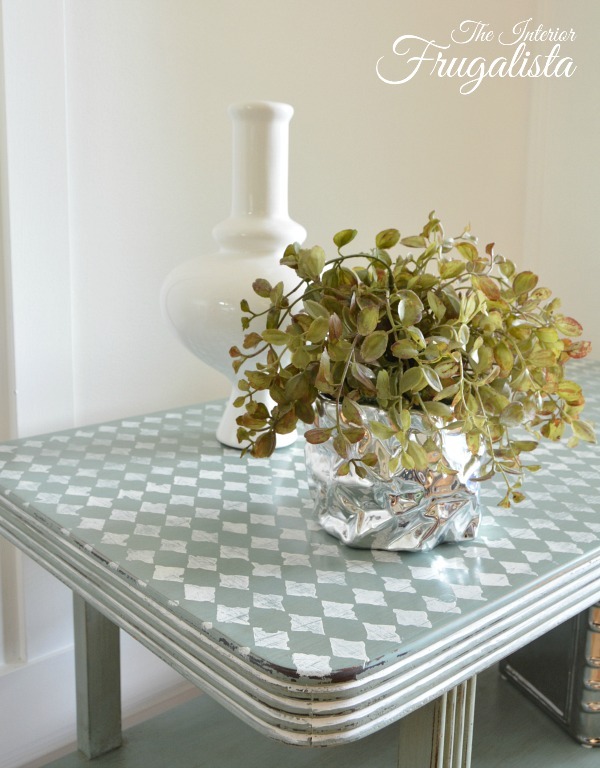 Perhaps try using a stencil as a border like I did on this Arabesque Night Table. The possibilities are endless and I promise that it gets much easier with practice. Disclosure: This post contains affiliate links so you can find the products I used for this project. What that means is that if you click on one of the product links, I will receive a small portion of any sales at no additional cost to you. I only share products I have used, ordered, or that are on my wish list. See my disclosure policy.